U.S. stocks finished in the red Thursday as investors took a step back and digested mixed economic news and a slew of earnings reports. The Dow Jones industrial average dropped 42 points, or 0.3%. The S&P 500 slipped 0.2% and the Nasdaq fell 0.1%. The major indexes were even lower earlier in the day. Stocks have stalled this week after a strong start to the year. 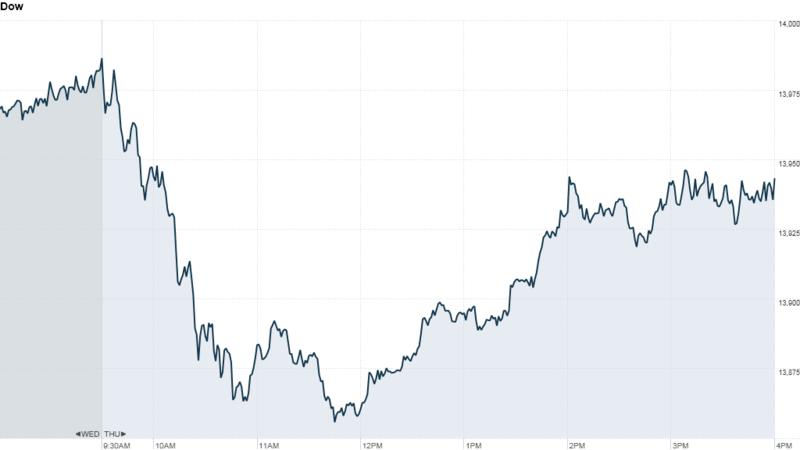 The Dow and S&P 500 are both up about 6% in 2013, and near their all-time highs. The Nasdaq has gained almost 5% so far this year. "The market has pretty much gone in one direction since the beginning of the year so perhaps this is just a natural pause," said Kim Forrest, senior equity analyst at Fort Pitt Capital. "It's possible that investors are taking a break." On the economic front Thursday, weekly initial jobless claims came in at 366,000, down 5,000 from the previous week but above forecasts. Meanwhile, the nation's business productivity dropped 2% in 2012's fourth quarter, according to the Bureau of Labor Statistics, which was more than economists were expecting. In corporate news, Akamai Technologies (AKAM), which provides Internet content delivery, delivered weak fourth-quarter results and a disappointing revenue forecast. The lackluster news sent the company's stock plunging 15%, making it the biggest loser in the S&P 500 and Nasdaq-100. News Corp (NWSA) was also a big laggard after the media giant issued a downbeat earnings forecast for the year. 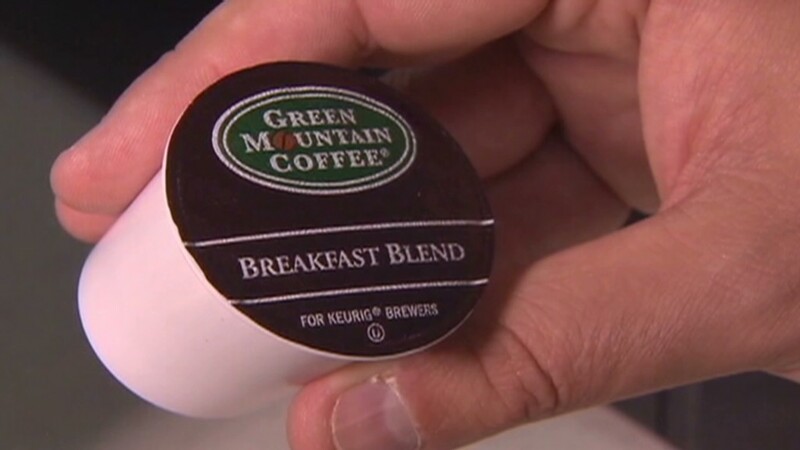 And Green Mountain Coffee Roasters (GMCR)shares tumbled on the company's weak outlook for sales growth. Sprint Nextel (S) shares faltered after the cell phone carrier reported a fourth-quarter loss in line with expectations. Shares of Sony (SNE) dropped after the electronics manufacturer reported a surprising third-quarter loss. Alcatel Lucent (ALU) posted another quarterly loss, sending shares lower. The communications equipment maker also said its CEO would be stepping down. On the positive side, JPMorgan Chase upgraded shares of Devry (DV) after the company reported better-than-expected earnings and revenue. The sock jumped more than 16%. Retailers were also big movers as they reported sales figures for January. Macy's (M) shares climbed after the retailer reported a better-than-expected 11.7% rise in same-store sales for last month. Gap (GPS), Costco (COST), Target (TGT) and Limited Brands (LTD) also posted January sales figures that topped forecasts. Shares of Blackberry (BBRY) gained ground after the smartphone maker said the Canadian launch of its new Z10 smartphone was its best launch ever. Apple (AAPL) shares were in the spotlight after activist investor David Einhorn publicly called for the electronics maker to give some of its $137 billion cash hoard to back to shareholders in the form of preferred stock. Apple responded Thursday afternoon, noting that the company's executives "have been in active discussions about returning additional cash to shareholders," and are considering Einhorn's proposal. Shares of Apple finished up nearly 3%. Following the closing bell, shares of LinkedIn (LNKD) spiked after the professional online network handily beat earnings and revenue estimates for the fourth quarter. European markets finished mixed after the European Central Bank and the Bank of England kept interest rates unchanged. Britain's FTSE 100 and France's CAC 40 slipped more than 1%, while Germany's DAX edged up 0.1%. During a news conference, ECB president Mario Draghi said the eurozone economy, which is set to contract for a second year running in 2013, could gradually recover during the second half of the year. But he warned that the risks to the outlook were still tilted to the downside. The dollar was up sharply against the euro, but lower versus the British pound and the Japanese yen. Oil and gold priced edged lower. The price of the 10-year Treasury rose, pushing the yield down to 1.95% from 1.97% late Wednesday.